What do you want to hold onto, and what do you choose to let go? Dreaming of our hands is actually not as common as many other parts of the body, but when we do dream of our hands or anothers, it often seems to have an unusually strong significance. Dreaming of hands is often a sign of self awareness, of taking control of our own life and destiny, or or of making an impact through our own actions on another person or the world around us at large. The unusual act of actually looking at your own hands in a dream is used by some to achieve lucidity, that is, to realise that they are actually dreaming. Our own hands in dreams are often taken for granted, many times simply functioning as tools which we use to make things happen, though we tend to focus more on the action and result than how we made this happen. If we stop long enough to notice our hands in our dreams, it can be a sign that we are becoming aware of our own influence, or lack of it. Dreaming of another person’s hands can often feel very intimate. 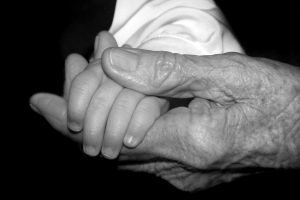 The two profound symbols of another’s hands in a positive context are of “holding hands” and of the “helping hand.” Both of these images require us to let someone else into our lives, to be open to love, affection, consideration or assistance. For this reason, hand dreams can leave us with a lingering feeling of happiness and warmth long into the day. These dreams may indicate that we are receiving assistance, affection or support from another in a waking life, but in many cases they are a symbolic representation that we are learning how to help our selves, that we are being kind to our selves where once we may have been a harsh judge, that we are befriending a part of ourselves that once we may have ignored or rejected, or even that we are healing a part of ourselves that once was sick and neglected. Of course, as with any dream symbol, there can also be a negative image. 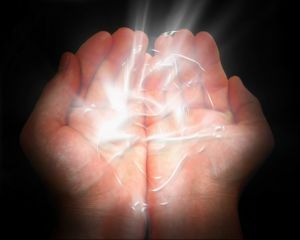 We may be noticing our hands in our dreams for the first time because they are empty, which may lead us to think what have we let go of, given up on, or given away that leaves us feeling “empty handed.” Hands can also be used to strike, to hold back and to push away. These kind of dreams invite us to question what controls or restrictions are we inflicting on our lives that prevent us from achieving what we want, or going where we choose. In short, how are we jeopardising our actions, and acting as our own worse enemy? – If you are looking at the back of your hand, it could mean there is something in your life you “know like the back of your hand”, or wish that you did! While hands themselves can have symbolic meaning our dreams, just as in our waking life, our hands can tell us things by what we do with them. 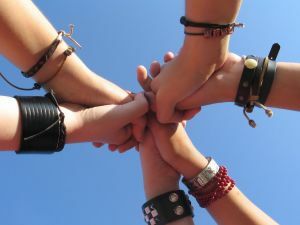 We communicate with our hands, we wave goodbye and hello, we gesture to come closer, to follow or to move away. We make things with our hands, we shape the world, our lives, we create and we control how things work. And with our hands we touch others, be it in kindness, with passion or to inflict pain. Our hands in dreams can reveal to us how we treat ourselves, and what we are doing to shape and control our own mind, influence our relationships and build the life we want to live. Reading this short blog was very enlightening 🙂 Was so young when the dream occurred and it’s remembered like I the day I woke up from it: My hands were extended from each side of my body, in each one of my hands was a hand of another with no knowledge who. As I looked from side to side, the hands’ in hands’ was endless and extended far beyond my sight. I knew it was a positive dream and a dream that had a purpose, just hope I am owning up to its Creator. Hmm…hands extended either side supposed to mean body language for good intentions, as in I mean you no harm. When I was eleven or twelve years old, I had this dream… I am walking around in the woods near my (real) home, searching for mushrooms. I was with a few (I think four) female friends of my own age and while we were turning the wet leaves, to look for mushrooms underneath, we found small childrens hands, chopped off, not bleeding any more, but cold, and a bit darkend (they had been white of pink probably, but now they had more or less the colour of the almost darkbrown winterleafs). (I ‘m sorry, all this does not sound pleasant). I rememer first seeing the back of the small hands, then turning them, palm up. My friends found childrens hands too, not all made ‘even’ pairs, so we concluded there may have been at least five victims (i am not sure about the number). It was quite shocking, we realized we had discovered a crimescene!, so close to home! All we found were small childrens hands, no other body parts, no bodies. The dream went on and the final outcome was very unexpected and so strange… the person who had killed all these children was a person close to me, who (as i found out at the end of the dream) had the power to become invisible … I never forgot this horrible dream, still unsure about the exact meaning, my main question is: what to think of all these childrens hands! I had a dream about my hands peeling and on the back of my left hand the skin had started to rot and made a hole in my hand. what does that mean? I had a dream recently that i was in an icecream parlor and they kept getting my order wrong, or id give them money and they were giving me the wrong change. I noticed that the que was absolutley huge as it was taking forever to get my order right. At the end of the dream I was eating my own hand straight off my arm. What on earth does that mean? I woke up feeling slightly disturbed. Ice cream is considered a very positive symbol (to me, anyway) for obvious reasons. So, you are being frustrated in acquiring something pleasant that you believe you have the right to, and frustrating others in the process? No judgement. I had this really strange dream where I performed that Chinese thing where you can gather electricity from nothing and as I reached into this world of electricity these pure white female hands with a blueish tint and rays of blue coming of them appeared (they almost looked like they where made of stone like a statues hands) they had a luxurious blue material from the wrist up but I couldn’t see any body or face. Then the hands started to carry me across my bedroom then I as I was awakening I felt my body shake from head right to my toes as if something had passed through me and I kicked my leg out n woke up. I can’t get the dream out of my head. I also had a strange dream last night where I was being choked by blue hands. Maybe not necessarily female, but I too couldn’t see a body or head. Just these blue hands and wrists that seemed to be surrounded by nothing but blank space or light, that I too remember looking craggy, like they could of been made from stone, reaching out and wrapping around my neck. I even woke up making a choking sound. But here’s the strangest part. I don’t remember being scared. I woke up with a normal heart-rate (if it had been a nightmare, my heart-rate would have been so fast). So I don’t feel as though the dream were threatening. I had a very troubling dream last night. It was quick and lucid, or rather, I could feel my body in the dream and I sensed I was in my bed, exactly where the dream happened. It felt more like a strange vision that was shown to me, but alas…My 5 year old daughter was sitting up in bed next to me and she kind of showed me her hands and they were black. That was it. It was deeply troubling and I immediately came to and looked at the clock (though now it seems like I awoke into a separate dream that then continued on, if that makes sense). Last spring I had a succession of dreams about my own hands (they were open to me an glowing, the palms were open like a seam, and another one where it allowed me to become lucid) and they were all very inspiring and lovely. This dream has left me with my heart in my gut. Thank you for the information on this site. It’s very helpful. I saw President Trump holding my hands in my dreams and I think we were married. What could this dream mean ? I have a theme that keeps repeating in my dreams very vividly and I can’t find an interpretation for it anywhere. In different scenarios, my hands are useless. I try to grasp something and it’s like my hands, and sometimes my arms, have lost all the muscle. I try my hardest, but my fingers just won’t close, or I can’t lift my arm. It’s really frustrating. The closest thing I can glean is that possibly I’m feeling powerless in my life and this is my subconscious translating that feeling into my dreams. Any thoughts? I’m hoping if I understand the meaning, this theme will stop. I always have the same recurring dream basically 3-5 times a week. I was wondering if anyone could help me figure out what it means… So the dream would start off me being on stage performing my ballet solo (i’m a dancer), and all of a sudden I would look up to my hands and they would get huge in just a few seconds. Then I ran off stage and I was screaming like “WHAT IS HAPPENING TO MY HANDS? !”, but no one else could see that my hands got giant and they all thought I was crazy. Then I would wake up and that would be the end. If anyone could help me that would be great because I have had that same dream for a little under 6 months. i had a dream of my left hand having thick hairs but not very large..n my cousin brother saying plz remove these all..what does it interprets..
I’ve dreamt of a black gloves hand reaching out to me as if telling me to take it and I reached out to take it with my own hand only everything was in darkness,the best way I can describe it is that I saw the shadow or out line of both our hands.what could it mean?? I dreamed about a priest. He seemed very kind and loving. He looked like the pictures of Jesus I’ve seen. Anyway, he led me off to where we were finally alone. And he took my hand and held it for some time. No words. The feeling was at first a little nervousness and then so nice and peaceful. I felt, out of everyone, he chose me. And that felt wonderful. We parted ways but I continued to look for him to reconnect again. I had a dream recently, and I was in the cinema (the movie wasn’t important so i didnt take any notice) and i was sitting close to one of my close guy-friends, I rested my head on his shoulder and our arms were laying next to each other, slowly our hands became entwined and stayed that way until I woke up. The whole ‘feel’ of the situation was romantic but there were no strong indicators of that. The whole thing felt like it took place within 2 minuets, but it was so carefully preserved and played out it felt like at least an hour. I’m just wondering if this dream is more to do with self (my own feeling/emotions) or if its to do with the relationship him and I have with one another. Thanks . I am very pleased with the interpretation of my dream. I hope to continue to seek your advice and guidance. Thank you for this explanation. I had a really confusing dream to do with hands though. I was eating at a restaurant that I normally love and I’ve eaten at many times, with someone but I don’t know who, and the restaurant had a new ‘special item’ on the menu: a human hand. I decided to order it because I wanted to try something new. Anyway, when they brought it out and I started eating it, a human hand on a plate, there turned out to be something wrong or distasteful with the dish so I asked the restaurant to bring me another hand to replace it. During this time I somehow sustained an injury on my own right hand, and I knew that I had lost it, that it was gone from my body but also somehow still on my body, and I didn’t think about it much. Then they brought out the new hand on the plate and I started to eat it and really enjoyed it at first. Then suddenly I had this sensation of eating SAMENESS, something that was so familiar it had to be a part of my essence, and then I realised I had been cooked and served my OWN hand. I recognised the hand by looking at one scar on the skin, which I do have in real life but not as raw as in the dream. Anyway, my dream self was very disturbed, and I spent the rest of the dream trying to convince the restaurant that they had done something terrible but no one seemed to take me seriously. What could all this mean? I had a dream that I was reaching for some flowers, to.throw them out, and felt something grabbing my wrist to stop me. It was a severed hand. I struggled to get it’s grasp off me and throw it away. What does it mean!??? I had a dream that some people were waiting to see the President come out to an entrance, like the porche of his residence. As he came out with his entourage, I and others had opportunity to shake hands with him. His hand shake was sustained and I decided I shouldn’t let it go first. I sat down on a porch chair in front of him, still holding his hand, which came off from his arm, as a glove. It was unexpected and my dream changed. I was at my house and a cat was calling at my door. There was nothing there but I could hear the cat meowing, which sounded like a small kitten in distress. I was disturbed and woke up.